We released Edit Flow v0.6.2 on Wednesday to fix two bugs. First, post titles now appear in all email notifications (thanks kfawcett and madguy000 for pointing this out). Second, bulking editing any post type should no longer inadvertently delete editorial metadata (thanks meganknight for pointing this out). As always, please hit us with feedback, ideas, and questions in the WordPress.org forum. We released Edit Flow v0.6.1 yesterday. While the version number suggests a minor upgrade, we’ve put a lot of work into this release and have a number of new features, improvements and fixes that you’ll enjoy. It’s a feature many of you have been asking for since Custom Post Types were added in WordPress 3.0. We’re happy to announce that Edit Flow is now custom post type-friendly. You can easily add or remove any Edit Flow feature to your custom post types with a few lines of code. We’ve included some code samples to get you started. Note: Custom post statuses are now enabled for pages by default as we’ve removed the option from the settings. You can disable them if you’d like with the remove_post_type_support() method. We’ve heard many of our users across the world are interested in translating Edit Flow into their native languages. With this release, we’ve gone through and cleaned up the plugin to make that easy. If you’re interested in providing a translation for Edit Flow, please get in touch and we’ll gladly include it with the plugin. Pig latin is a language too! If you have a large list of users, you now how difficult it can be to scroll through and find the exact person you’re looking for. 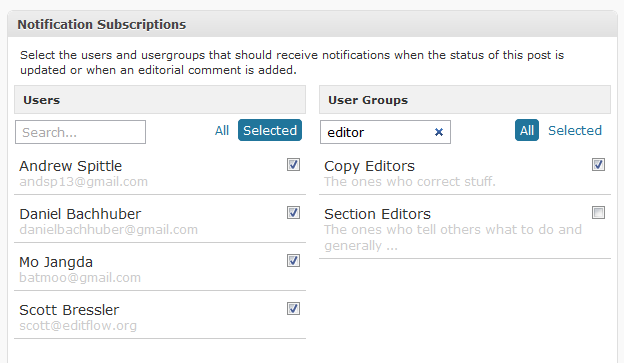 We’ve added filters and search-as-you-type to user and usergroup lists to make that a little easier. Emails sent by Edit Flow are now optimized to use queueing for improved performance (and to avoid being flagged as spam). For the full list of changes in this release, view the changelog. If you run into issues, the best place to go for help is the WordPress.org Support Forum. We just pushed out v0.5.3 which fixes the duplication issue that users have been reporting. Thanks to everyone for letting us know about the issue. You should be prompted for an upgrade from the WordPress admin, or you can download it here. On Wednesday evening, I also had the chance to update our roadmap to 1.0. The next scheduled release is 0.6 and will feature such awesome goodness (we hope) as better support for custom post types, custom task lists, and a refactored editorial calendar with story budget view.